Noel Atkins trained in the Royal Navy and served in the Reserve service for 20 years, receiving the Reserve Decoration from Her Majesty Queen Elizabeth II in 1980. He is a Business Director with over 25 years of board-level experience and had a long career in ICT services before holding posts with The Trussell Trust (Foodbanks), Worthing Homes, Worthing First for Business and Link to Hope (formerly Link Romania). Noel currently works for Heene Community Association as a Fundraising Development Manager. 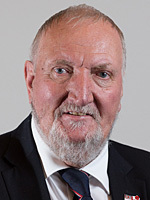 He has served on Hove Borough Council and is currently a member of Worthing Borough Councils where he has served as Mayor. Noel lives in Worthing and is a member of the Institute of Fundraising, the Conservative Christian Fellowship Meeting in the House of Commons, the Worthing Chamber of Commerce and the Royal Naval Association.